A team of international researchers including members of the Erlangen Centre for Astroparticle Physics (ECAP) at FAU has revealed a source of galactic cosmic radiation with petaelectronvolt energies for the first time: the supermassive black hole at the centre of the Milky Way. Their findings are based on a detailed analysis of the latest data from the telescopes in the High Energy Stereoscopic System (H.E.S.S.) in Namibia. Researchers have been mapping the centre of our galaxy in very-high-energy gamma rays using these telescopes – the most sensitive of their kind – for over 10 years. The results were published in the journal Nature on 16 March 2016. The earth is constantly bombarded by high energy particles from space. Together these particles – protons, electrons and atomic nuclei – are known as cosmic radiation or cosmic rays. The question of which astrophysical sources produce this cosmic radiation has remained a mystery to researchers for over a century. The problem is that the particles are electrically charged and are therefore deflected in interstellar magnetic fields, making it impossible to identify the astrophysical sources that produce them based on their arrival direction. Fortunately, however, the particles interact with light and gas in the neighbourhood of their sources, producing very-high-energy gamma rays that travel to the earth in straight lines. ‘These gamma rays allow us to visualise the sources of cosmic radiation in the sky,’ says Christopher van Eldik, a professor at FAU’s Erlangen Centre for Astroparticle Physics (ECAP) and deputy director of the H.E.S.S. collaboration. When a very-high-energy gamma ray reaches the earth’s atmosphere, it produces a flash of light that can be detected by reflector telescopes equipped with fast photo-detectors. Over the past few decades, over 100 sources of very-high-energy gamma rays have been identified in the sky using this technology. H.E.S.S., located in Namibia and operated by 150 researchers from 12 countries, is currently the most sensitive instrument that is able to record these rays. FAU researchers, who are responsible for analysing data as well as management tasks in the planning and technical co-ordination of the observations, make a significant contribution to the success of the project. Researchers already know that cosmic rays with energies of up to approximately 100 teraelectronvolts (1 TeV = 1012 eV) – around 1000 billion times larger than the energy of visible light – are produced in the Milky Way. However, theoretical arguments and direct measurements of cosmic rays indicate that the cosmic ray factories in our galaxy should be able to accelerate particles to energies of at least one petaelectronvolt (1 PeV = 1000 TeV = 1015 eV). 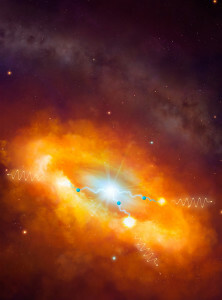 While many sources that accelerate particles to multi-TeV energies have been discovered in recent years, so far the search for the sources of the highest energy galactic cosmic rays has remained unsuccessful. An analysis of further observations made by H.E.S.S. between 2004 and 2013, which has now been published in the journal Nature, sheds new light on the processes that accelerate cosmic rays in the centre of the galaxy. In 2006, H.E.S.S. uncovered a very compact source of gamma rays in the region of the galactic centre, as well as diffuse very-high-energy gamma-ray emission from the surrounding area. This diffuse radiation, produced when cosmic rays interact with gases in this area, provided a clear indication that there must be a source of cosmic radiation in this region. However, at the time the researchers were unable to identify it. ‘In recent years we have not only collected new data but also refined the techniques we use to analyse it. We are therefore now able to determine the spatial structure and the energy of cosmic radiation in the centre of the galaxy for the first time,’ Christopher van Eldik explains. The unparalleled measurements show that there is a particle accelerator in the centre of the galaxy that is capable of accelerating protons to energies of up to one petaelectronvolt. The researchers have dubbed such a source a pevatron – in analogy to the Tevatron, the first man-made particle accelerator that achieved an energy of one teraelectronvolt. Based on the measurements of the the gamma-ray emission from the centre of the galaxy, the researchers believe that it is likely that Sagittarius A* is accelerating protons to PeV energies. However, the measurements also show that this source alone cannot account for the total flux of cosmic rays detected on earth. ‘If, however, Sagittarius A* was more active in the past,’ Christopher van Eldik explains, ‘then it could indeed be responsible for the bulk of today’s galactic cosmic rays that are observed on earth.’ If true, this would dramatically influence the century-old debate on the origins of galactic cosmic rays, as the theory that their components are primarily accelerated to PeV energies by remnants of supernovae – shock waves that occur after the explosion of massive stars – would have to be revised to take this into account.